Now Nathan cooks dinner at home a couple nights a week. From roasting peppers and other vegetables he never would have tried before the demonstration, Martha says he’s determined to make cooking his career. The cooking demonstration that inspired Nathan was an initiative of the Shape Up North Fruit and Vegetable Prescription Program. 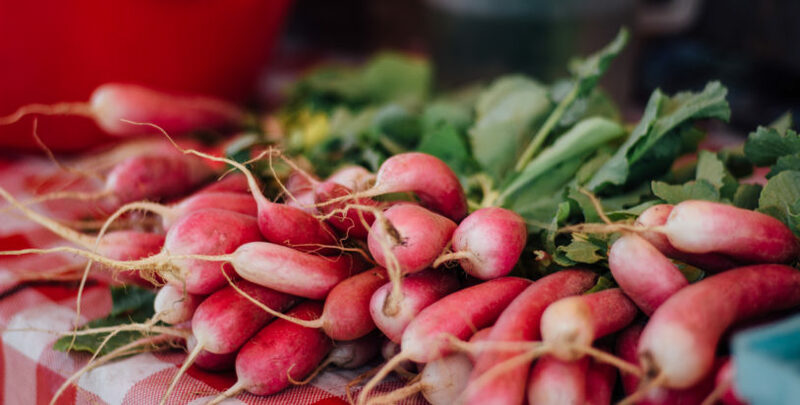 Through nutritional education, cooking demonstrations and coupons to purchase fresh produce, the program instills strong partnerships between patients, their healthcare providers and the local food sector all while supporting healthy behaviors. Martha first heard of the Fruit and Vegetable Prescription Program after seeing a poster up at Nathan’s doctor’s office. A few questions later and they were registered. The roasting peppers cooking demonstration was the first of several events they’ve attended. They’ve also benefited from the Fruit and Vegetable Prescription Program market coupons, which they were able to use to purchase fresh vegetables and fruits from local farmers markets. Next on Nathan’s culinary journey was another cooking demonstration—this time, about cooking squash—which Nathan now regularly incorporates into his meal planning at home. “He’s roasted radishes, tomatoes—he never would have done that before,” Martha says. Nathan has also learned how to sear chicken. Pictured here is the second dinner Nathan cooked for his family this summer: Seared chicken with a light orange sauce and thyme garnish with fresh vegetables and a sliced banana. To support Nathan’s new love for cooking, Martha found a couple cookbooks at a local thrift store and encourages him to make a new recipe for the family every week. She says that incorporating parsley into his vegetable dishes is Nathan’s current favorite. 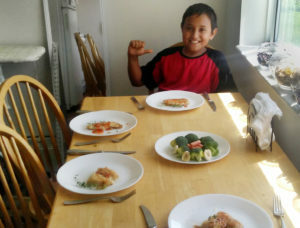 Using his kid-sized cooking kit from the Fruit and Vegetable Prescription Program, Nathan chops up tomatoes, onions, celery, parsley and makes a vinegar-based dressing for his vegetable dish. Martha attributes Nathan’s new love for cooking to the Fruit and Vegetable Prescription Program. “It’s such a good program,” she says. “I got to eat really good fresh fruits and vegetables, which a lot of times we either can’t afford or what we get isn’t that fresh.